Downton Abbey is like crack. My current beef with the show (aside from the fact that I wish I’d discovered it 5 seasons in so I didn’t have to wait for new episodes) is that it doesn’t let me properly hate the nastier characters. I’m sick of shows and movies that don’t allow the audience to have proper Disneyesque villains to hate. Sure, I believe in redemption and realism (even bad people have good parts?) but occasionally I’d like a proper representative of evil in my fiction. Like Voldemort and Cruella De Ville. Also: stop trying to redeem people after they have been murderers. (Heroes is very guilty of this). You are a murderer. Fine you had a bad childhood. I know plenty of people with bad childhoods who manage to take it out on their therapists and spouses instead of killing people. 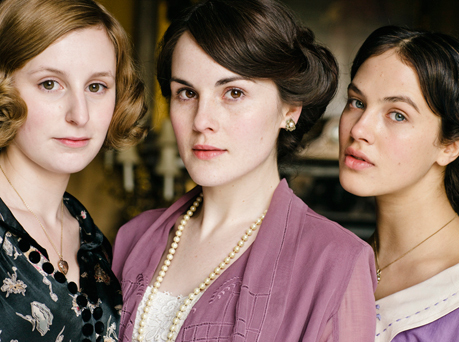 Oh, but I love Downton Abbey. The details of the set, the beauty of the house, the historical aspect, the love triangles and drama and comedy and character development. I don’t drug myself when flying even though I have a mild phobia. My logic is this: If you are going to crash and burn, you will likely wake up anyways, so why not enjoy the free entertainment? (The free entertainment being not the crashing and burning but the personal mini TVs international flights have. Trivia games against other passengers? Yes, please.) Also, occasionally people survive crashes, and it would be a bummer to be the one left behind because I didn’t actually wake up from my drug-induced coma. 1) Before flight, use credit card to purchase chosen seat close to exit. 2) If desired exit seat is not available, when on plane constantly count seats between you and exit row. Both ways. 3) Be only person on flight to read Flight Safety information. Stare at confusing diagrams. Subtlety feel around with hand under seat for life jacket. 4) Make friends with seatmate. Laugh while telling them about mild phobia and every single turbulent flight you have been on. Include story of flights that have EXIT signs blink on. 5) During turbulence add numbers, read magazine, pretend you are David Bowie. Do not acknowledge imminent death. And that’s it for now. But a note to people who don’t understand their friends phobias: planes are bits of metal hurtling through the air. Their maintenance and direction is under fallible people and easily broken machines. This is different than your fear of non-poisonous creatures that are 1/100th of your size. Also, don’t tell someone with a flying phobia that planes are safer than cars and elevators. This may be true, but it’s more likely that they’ll accept your logic by developing a fear of driving and elevators rather than eradicating their own fear. He and I later bonded over our overly competitive responses to “Catch me if you can” – a campus wide water gun game. Participants get a slip of paper with a target’s name on it. Once you hunt and “kill” your target (Facebook, class lists, word of mouth), you get your target’s slip of paper. I believe we spent a few hours staring out the window of psych building (safety indoors) monitoring the entrance of the cafeteria for our victims. Don’t you dare get me started on a new TV show. I’m getting swamped. -Order copious amounts of alcohol and start hitting on the person across the aisle for you. Looked like it worked wonders (this also works for if you just want to drink a lot but want an excuse not to get cut off). -Go talk to the flight attendant as if she were your therapist and repeatedly express the same fears until said flight attendant a) runs out of reassuring statistics, b) begins to doubt her career choice, c) offers you her iPod as a distraction, or d) really has to go back to work already. p.s. I heart playing trivia with other passengers. I even won once. Apologies, Emma. It’s how Shiv wrote it. oops. I see how that might be a problem.